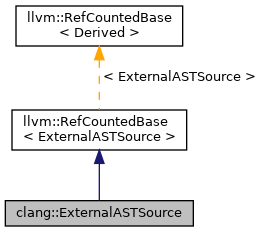 External AST sources provide AST nodes constructed from some external source, such as a precompiled header. External AST sources can resolve types and declarations from abstract IDs into actual type and declaration nodes, and read parts of declaration contexts. Definition at line 62 of file ExternalASTSource.h. Definition at line 197 of file ExternalASTSource.h. Gives the external AST source an opportunity to complete the redeclaration chain for a declaration. Called each time we need the most recent declaration of a declaration after the generation count is incremented. Reimplemented in clang::ASTReader, and clang::MultiplexExternalSemaSource. Definition at line 58 of file ExternalASTSource.cpp. Referenced by FindExternalLexicalDecls(), and clang::ASTContext::getLangASForBuiltinAddressSpace(). Reimplemented in clang::ExternalASTMerger, and clang::MultiplexExternalSemaSource. Definition at line 60 of file ExternalASTSource.cpp. Referenced by clang::ExternalASTMerger::CompleteType(), clang::ObjCInterfaceDecl::CreateDeserialized(), and FindExternalLexicalDecls(). Gives the external AST source an opportunity to complete an incomplete Objective-C class. This routine will only be invoked if the "externally completed" bit is set on the ObjCInterfaceDecl via the function ObjCInterfaceDecl::setExternallyCompleted(). Reimplemented in clang::MultiplexExternalSemaSource, and clang::ExternalASTMerger. Definition at line 62 of file ExternalASTSource.cpp. The default implementation of this function is a no-op. Definition at line 114 of file ExternalASTSource.cpp. Referenced by clang::DeclContext::lookups(), and updateOutOfDateIdentifier(). Definition at line 167 of file ExternalASTSource.h. Finds all declarations lexically contained within the given DeclContext, after applying an optional filter predicate. IsKindWeWant a predicate function that returns true if the passed declaration kind is one we are looking for. The default implementation of this method is a no-op. 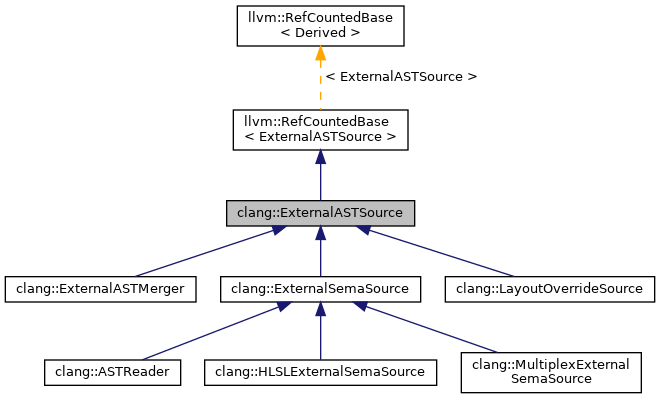 Reimplemented in clang::ASTReader, clang::ExternalASTMerger, and clang::MultiplexExternalSemaSource. Definition at line 116 of file ExternalASTSource.cpp. Referenced by clang::DeclContext::BuildDeclChain(), FindExternalLexicalDecls(), and clang::RecordDecl::isMsStruct(). Definition at line 215 of file ExternalASTSource.h. References CompleteRedeclChain(), CompleteType(), FindExternalLexicalDecls(), FindFileRegionDecls(), FinishedDeserializing(), layoutRecordType(), PrintStats(), ReadComments(), clang::Result, StartedDeserializing(), and StartTranslationUnit(). Find all declarations with the given name in the given context, and add them to the context by calling SetExternalVisibleDeclsForName or SetNoExternalVisibleDeclsForName. true if any declarations might have been found, false if we definitely have no declarations with tbis name. The default implementation of this method is a no-op returning false. Definition at line 109 of file ExternalASTSource.cpp. Referenced by clang::DeclContext::lookup(), and updateOutOfDateIdentifier(). Length can be 0 to indicate a point at Offset instead of a range. Definition at line 54 of file ExternalASTSource.cpp. Must be paired with StartedDeserializing. Definition at line 68 of file ExternalASTSource.cpp. Referenced by FindExternalLexicalDecls(), and clang::ExternalASTSource::Deserializing::~Deserializing(). Resolve the offset of a set of C++ base specifiers in the decl stream into an array of specifiers. Definition at line 104 of file ExternalASTSource.cpp. Resolve the offset of a set of C++ constructor initializers in the decl stream into an array of initializers. Definition at line 99 of file ExternalASTSource.cpp. This method only needs to be implemented if the AST source ever passes back decl sets as VisibleDeclaration objects. Definition at line 82 of file ExternalASTSource.cpp. Referenced by clang::AccessSpecDecl::CreateDeserialized(), getGeneration(), and makeStandaloneDiagnostic(). This operation is meant to be used via a LazyOffsetPtr. It only needs to be implemented if the AST source uses methods like FunctionDecl::setLazyBody when building decls. Definition at line 94 of file ExternalASTSource.cpp. This operation only needs to be implemented if the AST source returns non-zero for GetNumKnownSelectors(). Definition at line 86 of file ExternalASTSource.cpp. Referenced by AddClassMessageCompletions(), and getGeneration(). This number is incremented each time the AST source lazily extends an existing entity. Definition at line 96 of file ExternalASTSource.h. References GetExternalCXXBaseSpecifiers(), GetExternalCXXCtorInitializers(), GetExternalDecl(), GetExternalDeclStmt(), GetExternalSelector(), GetNumExternalSelectors(), and Offset. Return the amount of memory used by memory buffers, breaking down by heap-backed versus mmap'ed memory. Definition at line 320 of file ExternalASTSource.h. References clang::C, incrementGeneration(), SetExternalVisibleDeclsForName(), and SetNoExternalVisibleDeclsForName(). Referenced by clang::MultiplexExternalSemaSource::getMemoryBufferSizes(), and clang::MultiplexExternalSemaSource::layoutRecordType(). Definition at line 120 of file ExternalASTSource.cpp. Definition at line 163 of file ExternalASTSource.h. Definition at line 90 of file ExternalASTSource.cpp. Definition at line 30 of file ExternalASTSource.cpp. Definition at line 35 of file ExternalASTSource.cpp. Definition at line 122 of file ExternalASTSource.cpp. This routine allows the external AST source to provide an specific layout for a record, overriding the layout that would normally be constructed. It is intended for clients who receive specific layout details rather than source code (such as LLDB). The client is expected to fill in the field offsets, base offsets, virtual base offsets, and complete object size. Record The record whose layout is being requested. Size The final size of the record, in bits. Alignment The final alignment of the record, in bits. FieldOffsets The offset of each of the fields within the record, expressed in bits. All of the fields must be provided with offsets. BaseOffsets The offset of each of the direct, non-virtual base classes. If any bases are not given offsets, the bases will be laid out according to the ABI. VirtualBaseOffsets The offset of each of the virtual base classes (either direct or not). If any bases are not given offsets, the bases will be laid out according to the ABI. true if the record layout was provided, false otherwise. Reimplemented in clang::MultiplexExternalSemaSource, and clang::LayoutOverrideSource. Definition at line 74 of file ExternalASTSource.cpp. Definition at line 72 of file ExternalASTSource.cpp. Definition at line 64 of file ExternalASTSource.cpp. Definition at line 1342 of file DeclBase.cpp. Referenced by clang::ExternalASTMerger::FindExternalVisibleDeclsByName(), and getMemoryBufferSizes(). Definition at line 1327 of file DeclBase.cpp. Notify ExternalASTSource that we started deserialization of a decl or type so until FinishedDeserializing is called there may be decls that are initializing. Must be paired with FinishedDeserializing. Definition at line 66 of file ExternalASTSource.cpp. Referenced by clang::ExternalASTSource::Deserializing::Deserializing(), and FindExternalLexicalDecls(). Function that will be invoked when we begin parsing a new translation unit involving this external AST source. Definition at line 70 of file ExternalASTSource.cpp. Definition at line 144 of file ExternalASTSource.h. Definition at line 63 of file ExternalASTSource.h.